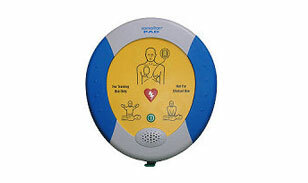 The HeartSine Samaritan AED Trainer provides the perfect solution for all your training needs. Complete with rechargeable battery, seven language options, and instructional display, the Samaritan AED Trainer makes your job as an instructor much easier and more cost effective. No more batteries to replace! Teaching a class in a foreign language? No problem! Want to show your students what will show up on the AED screen during actual use? Our instructional display label simulates proper pads placement graphic, battery-life indicator, number of shocks delivered, and time elapsed.